Welcome back to Valerie’s Variety Podcast, VSquared and our first promo clip, this clip is encompassing highlights from our past episodes 1 through to 12. April 15 from our very fist episode to July 17 q and a between mom and 6 year old. Was very fun to put together and reminisce although it hasn’t been very long…it was still nice to go back and listen to these episodes. Would love to promote your show or product on my podcast? Interested in doing an exchange – let me know as I’d love to collaborate and spread the word about this show and yours. The intro is by Janice Wilby and outro for this podcast is recorded by London Moss. The music included within these snippets is all through Garage Band The podcast is written and produced by me Valerie Moss, through Garage Band and WordPress. 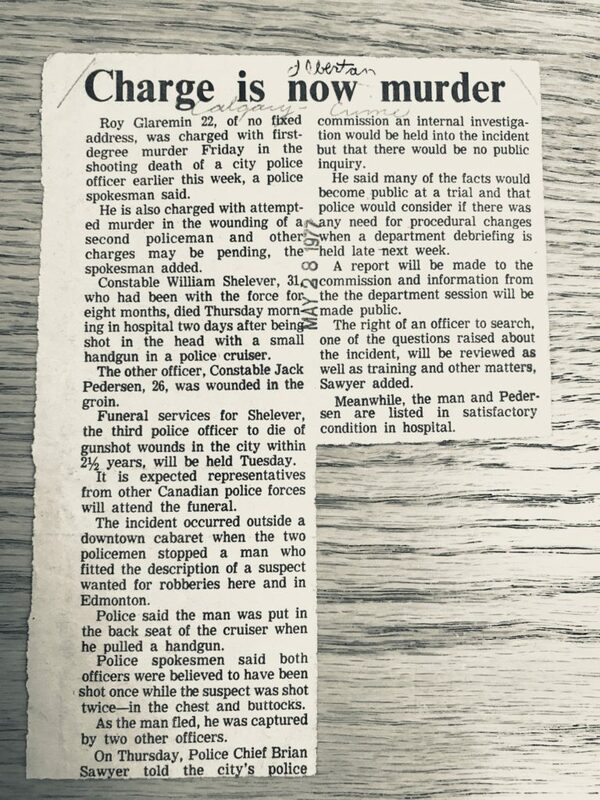 I recently did an episode investigating in Calgary, i spent some, well many hours at the Calgary public Library looking for something interesting to podcast about that is Calgary driven and from the 1970’s in the past, not a currently discussed topic . I first came upon the Local History room at the library and got comfortable….upon further inspection I came across many articles that have been clipped out of the newspaper and categorized into envelopes one marked crime and criminals. I opened these envelopes up and came upon several clippings about this one case in 1977.
for my first Calgary History episode about two girls found dead under the happy valley overpass, I found it interesting to combine the stores and actually write a column on this story…moving into the William Bill Shelver case I wanted to push myself and step this up another notch. I find it very interesting listing to the podcast serial with Sara Kanik as she a) is a great story teller and b) includes actual clips from the people she’s talking about. I asked Jeff my hubby if he’d be up for helping me out as he has in the past but he waste’ into it for the quantity of lines I required…when I thought about who I could get, I had a great idea to reach out to my fellow podcasters and ask if anyone would be interested in contributing to this story as a voice over. I’m not quote at the investigative journalism point where I can spend more hours of personal time finding, sourcing and interviewing these people from my stories….YET! so I first went through all of the articles and research I came upon and created my list of “quotes” that people within these stories said then I reached out to my Facebook communities for podcasters and asked who might be interested in reading some lines male and females…well that was easier than I thought – thank you! (p.s. if you’re interesting in doing voice work for me in an upcoming episode, please touch base with me as I’d be so gracious) I immediately had so many people offering to assist with my 14 lines that I had extra entries. Due to the graphic and sensitive nature of the story and wanting to pay tribute and highly respect the Calgary Police Service I made sure that I was true to what these people said and in the context that they said it within. I placed these characters in Alphabetical order for ease of layout and organizing but they were within the episode in possibly more than one appearance as well. Some even had two different people to quote. The criteria was simple, here’s the line in “quotes” please say the line 2-3 times I would provide descriptive words and possibly a setting. In exchange for this unpaid position I requested a snippet of their podcast or a promo clip to insert. Andy Ace as Deputy Howard Leary here’s his entry and his promotion clip. <insert clip here> I didn’t receive a promo clip for Austin but thank you for helping me with my show. <insert clip here> I received several entries for this line but I could only choose one, thank you Bridge for helping me out, I sure appreciate it and I think you did a great job! <insert promo clip here> for Tales of the Trade Features our region’s pioneers & the stories behind the ideas they brought to life. Each episode highlights the challenges & triumps of the enterpreneurial journey & a legacy in the making. New episode every second Tuesday. <insert promo here> for Dustin Danzer Podcast and You Tube Site he has a you tube and podcast page. he answers questions with comic relief addressing tough questions and discuss life and popular issues on planet earth. <insert clip here> this was kind of neat as she was interested in contributing and when I went to her facebook page she lives in Germany, I ask if she can speak English like a Canadian, she sent me a voice note through messenger and voila she not only speaks english but does sound like a Canadian…until she says her promo, she’s Swedish and runs a Swedish podcast. She’s likely the most important voice within this story as she was the wife left behind with a baby bump and now a …window. I thought Karin did a great job. 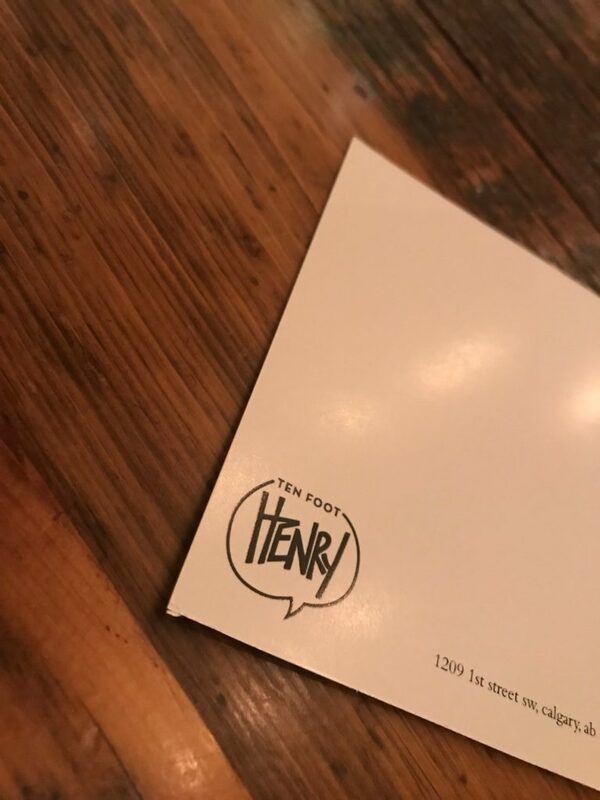 <insert promo here> her’s is in Swedish…thanks Karin how neat is this? <insert promo clip here> for Assumptions Podcast A podcast in which two friends, a Christian and an Athiest, try to understand the other’s worldview. Created by Kyle Marshall and Daniel Melvill Jones. I had the advantage to meet Kyle on a couple of occasions now, he’s very well spoken, an English major and Owner of MediaLab a bridge-co working space in downtown Calgary check him out! <insert promo here> for Repodcasting Join hosts Janet and Lucia as they recast your favourite (and not so favourite) movies! <insert promo clip here> for Phil Better Show The award winning* talent filled* podcast of this generation! That’s right The Phil Better Show is the show that you want to listen to as its so full of movie and TV reviews, comments, and overall WTF that you won’t be able to get enough!!! Subscribe NOW!!!! *All claims are those of the creator and may not be true… well only in his own head. <insert promo here> for Clarineat a show about clarinets from Calgary Alberta Canada, one of the top 10 classical music podcasts. Thanks for taking the time to hang out with us in this behinds the podcast show in the Shelever case. my goal was to represent the characters in the right context and true to the scene of the stories and articles I came upon. 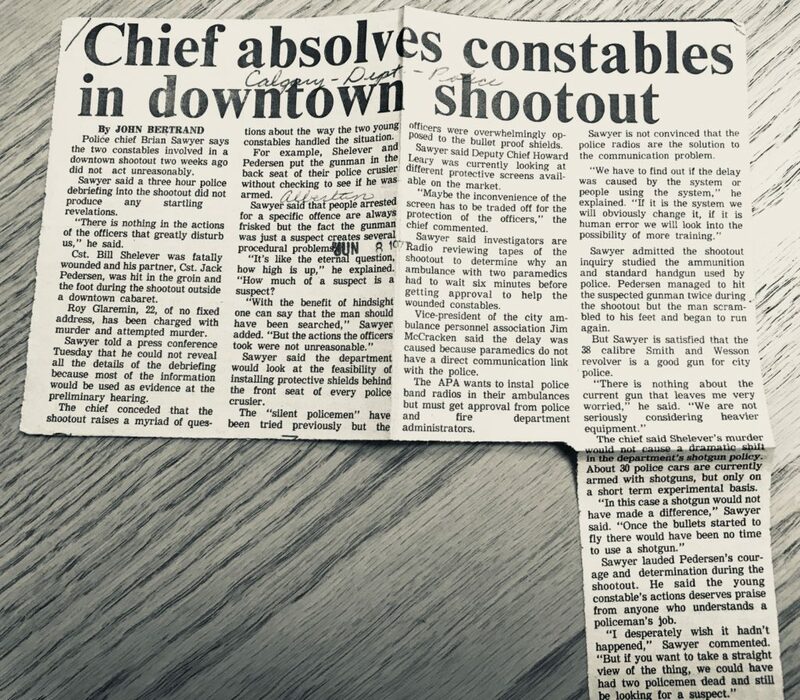 Were you around during this time, do you remember the William Shelever case one of our city’s finest lost his life doing what he loved best, by being a police officer. Here’s to Mrs. Shelever and her daughter Billie and all the CPS members sworn and unsworn, we value your service to our community, Thank you! Having friends in the police force in Calgary raining from Detectives to K-9 and surveillance makes me reflect on their jobs and skills – their sheer determination to make our streets better – safer. Having been on a “ride-a-long” (check our my blog for these stories – maybe a future podcast) and seeing what they go through first hand also makes me contemplate the sheer magnitude and intimate nature of the job. Going into peoples homes, searching people and speaking directly about the concerns at hand. Very intimate and personal. 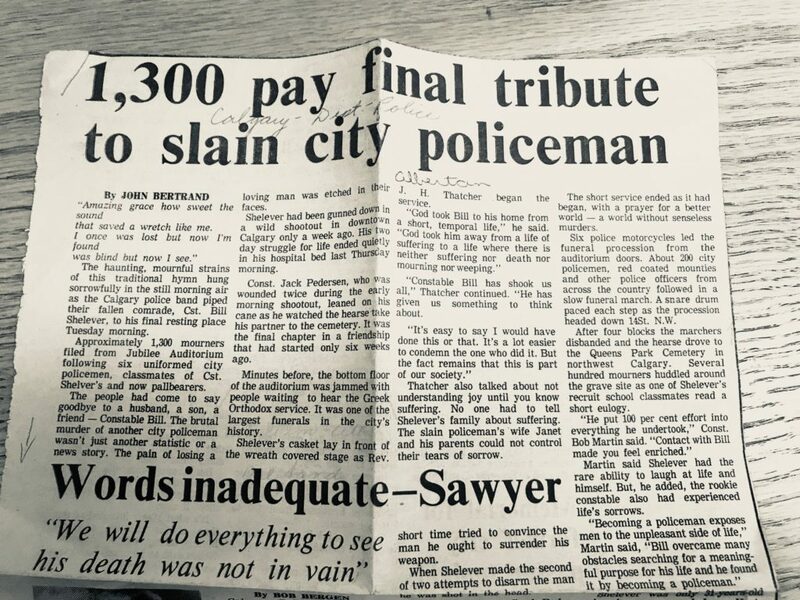 So when I came across this article well many articles about this fallen policeman I wanted to pay tribute to this story from the 1970’s. In 1993, as a direct result of the hit and run death of Constable Rick Sonnenberg, the Helicopter Air Watch for Community Safety (HAWCS unit) was created, and the Calgary Police Service became the first law enforcement agency in Canada to incorporate the use of air support into its routine operations. In 2006, the unit was expanded when a second helicopter was purchased. I will be featuring William Bill Shelever who lost his life to gunfire in 1977 as one of these 11. 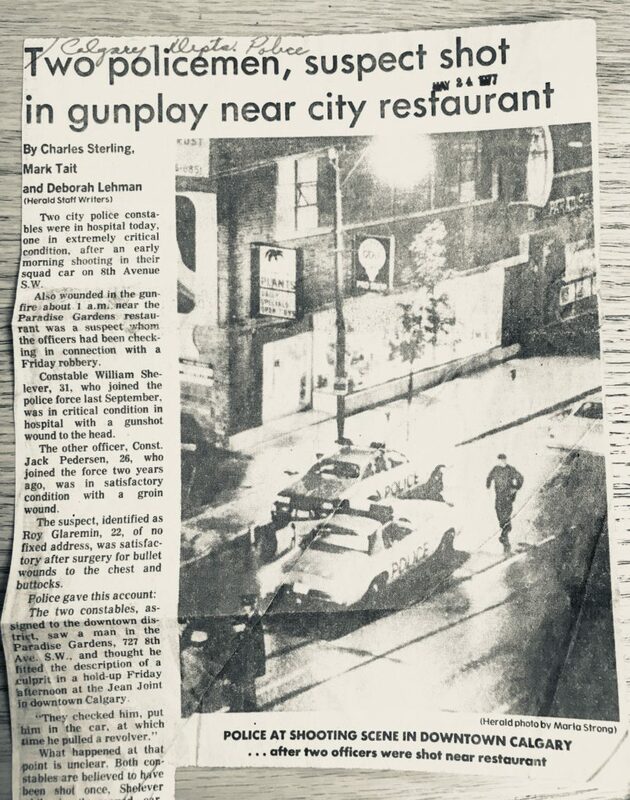 The scene shows two police cruisers under the light of the street lamps, with a neon plant sign overhead, one police officer running toward the camera another ring is lit up and sales Pro Shop, caption reads “police at shooting scene in downtown calgary….after two officers were shot near restaurant. 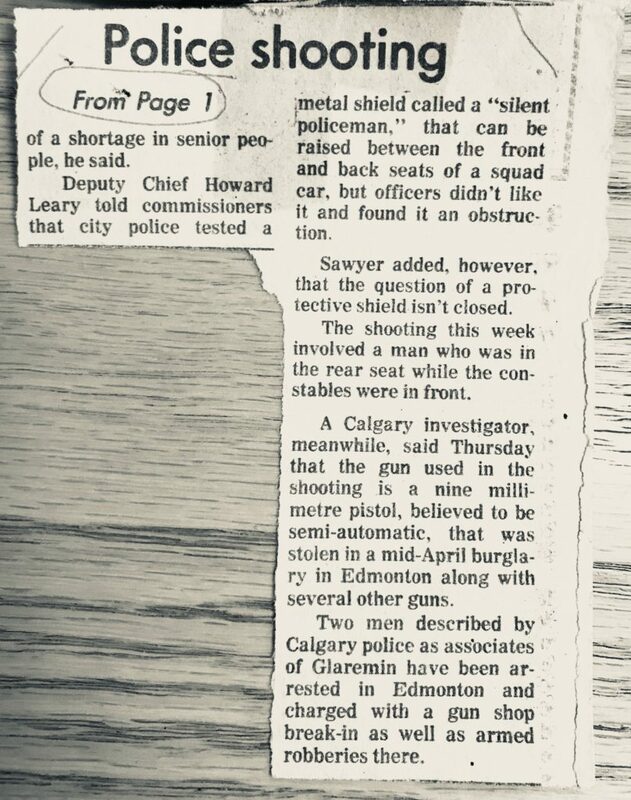 They were shot in their mobile office they were shot in their squad car on 8 avenue SW. Them as well as another assailment – a known robber was also shot on Friday. 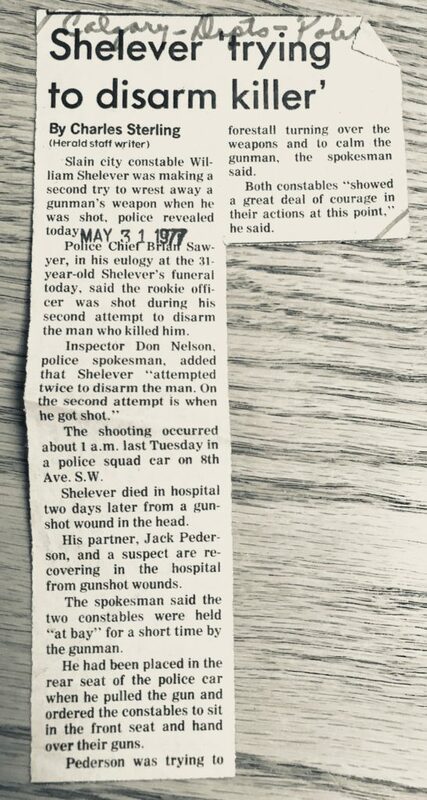 One of these officers William (Bill) Shelever, just 31 years old and only 6 weeks on the job was shot in the head. The other officer was 26 years old and he was shot in the groin. The suspect, Roy Glaremin only 22 years old was shot in the chest and buttocks…and was satisfactory after surgery saved his life once a few bullets were removed and he was sewn up. The story goes something like this: There was a holdup Friday afternoon at the jean Joint, downtown Calgary a separate incident. The two policemen men Shelever and Pedersen were patrolling downtown around 1am when they saw a man that fit this description (Roy Glaremin) the culprit from earlier. 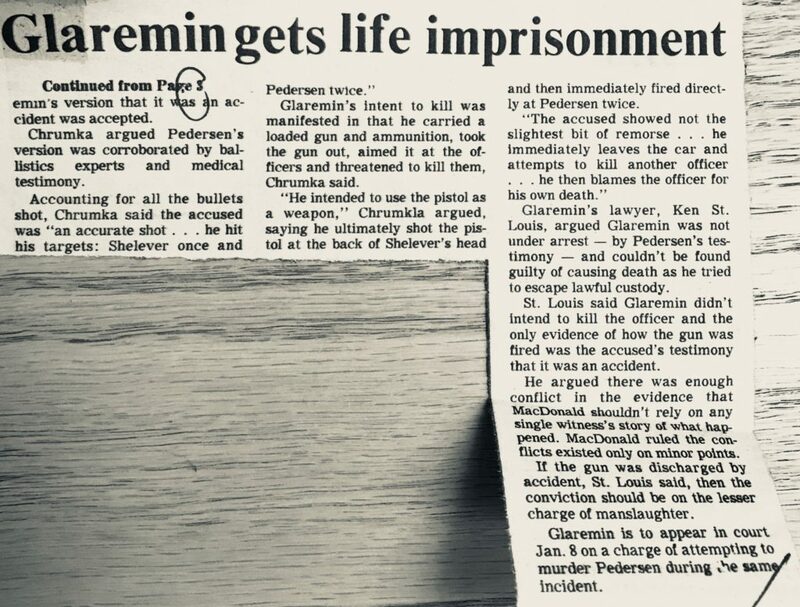 When they approached him they asked him to come back to the Police car, while there, Shelver made an unsuccessful attempt to take the gun away -Glaremin demanded that the two officers turned over their guns and Pedersen stalled trying to get handcuffs and flashlight.They checked him (not like a full search) and put him in the back of the car…The fact that he was a suspect didn’t produce the official signal of a true/ thorough search then he/the suspect pulled a revolver immediately and shot Shelever once in the back of the head, the second officer went to flee the vehicle and was shot two times. Once in the leg and another time in the buttocks however another news article says one of these slugs hit his Petersen’s foot. Peterson, the second officer shot the gunman two times as he fled he as scene limping and excited as he continued to search for the suspect. Shooting the suspect two times also called into question the type of guns that policeman have – why shooting a suspect twice, could this suspect get up and continue to run?Two other officers captured the suspect shortly thereafter. The night Manager at the Holiday Inn heard over half a dozen gun shots and saw a police officer lying wounded in front of the Pink Panther nightclub located at 725 – 8 avenue SW (Currently this is the Queenswood House Apartments. and the other one was running and holding himself across this body and was believed to be Pederson. When the two officers captured the suspect at 7 street and 7 avenue sw which currently resides the Nexen Tower, Sprague Drugs, Scotia Bank Tower and of course the c-train track on 7th avenue. William (Bill) Shelever was in all account a rookie cop, he has a square jaw, short dark hair and tinted glasses, clean shaven, all of 31 years old, 6 weeks on the job, he was married with no kids. Being born in Belgrade known as the “white city” in Serbia, Shelever and his parents moved to Calgary, to the Forest Lawn district around 1943 and he graduated from Forest lawn High School in 1945. In 1969 he earned his welding papers and as he worked at Barber Industries – he was looking for more and to make a difference and changed his focus to becoming a police officer. Such a selfless honourable decision. Pederson, Shelever’s partner was only 26 years old, with 2 years of training and street experience in the downtown area of Calgary. Peterson is slim faced, moustache, small eyes and serious looking. Such a young sole in a heavy, responsible work life. What is this style of gun? It has a chamber that holds the ammunition in a 6 chamber round, each round could potentially hold 15-17. It’s a revolver, meaning the chamber revolves exposing a new bullet to dislodge and fire. It can shoot up to 1800meters, 5400 feet to a man sized target. The bullet size is 9mm or almost 1/2 inch in diameter, weight approx 150 grams and the bullet shooting at approx 1200 feet/second, this is a small, lightweight, fast, effective gun. Glaremin had a direct shot at close range, deliberate. The Smith & Wesson Model 10, previously known as the Smith & Wesson .38 Hand Ejector Model of 1899, the Smith & Wesson Military & Police or the Smith & Wesson Victory Model, is a revolver of worldwide popularity. It was the successor to the Smith & Wesson .32 Hand Ejector Model of 1896 and was the first Smith & Wesson revolver to feature a cylinder release latch on the left side of the frame like the Colt M1889. In production since 1899, it is a six-shot double-action revolver with fixed sights. Over its long production run it has been available with barrel lengths of 2 in (51 mm), 3 in (76 mm), 4 in (100 mm), 5 in (130 mm), and 6 in (150 mm). Barrels of 2.5 inches (64 mm) are also known to have been made for special contracts. Some 6,000,000 of the type have been produced over the years, making it the most popular handgun of the 20th century. Both officers were wearing bullet proof vests which only came out 7 years prior to this incident. Unfortunately due to to the aim of the gun shot, missed the bullet proof vest and hit Shelver in the back of the head behind his left ear. Also, at this time, in the 1970s the “silent” officer, the bullet proof glass cage was not invented yet nor was being administered and discussed as a usable, safety precaution however was revisited with more officers describing it as an obstruction – little did they know then how valuable this would be in a very short time. Police Chief Brian Sawyer was also being questioned about this new ‘silent police officer’ and not ruling this out as an added benefit and defence for safety. Cst. Shelever was survived by his wife Janet and a daughter, Billie, who was born a few months after his death. His wife gave him this amazing news just days before he lost his life to Glaremin. He also left behind his parents Andriy and Olena (Helen), extended family and many friends, he was an only child. 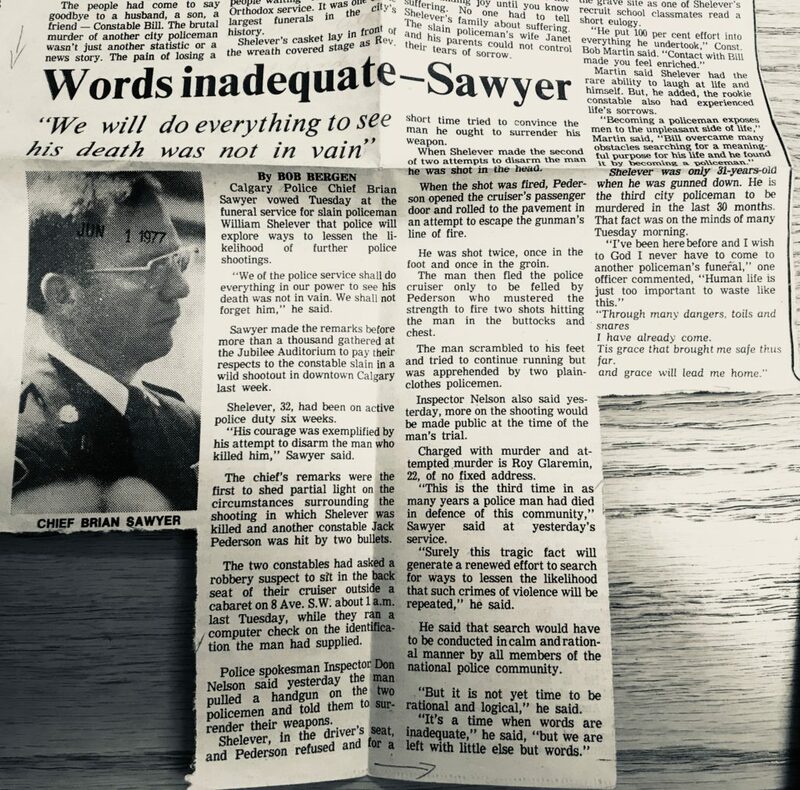 That’s Constable Bill Martin, can’t you just hear how he felt about Constable Shelever making the decision to become a Police Officer, likely a reflection of his own purpose. That’s Zone Sergeant Shaw again talking about Shelever’s character and future. at 10am More than 1000 people paid their respects to the fallen officer, the 3rd officer down in as many as 30 months and one week after the shooting, This was held in the remarkable Jubilee auditorium with honour guards, pipe band, and representative from other forces. where the police force gave an incredible reflection on changing policy and how they conduct searches, and have put the promise out there to protect their officers during their very difficult positions on the job. 6 police motorcycles led the funeral procession from the auditorium doors, 200 red-coated mounties from across the country followed and a solo snare drum saluted each step down 14 street NW. this was an officer speaking about Shelever around the time of the funeral, can’t you just hear the impact something like this has on one of their own? 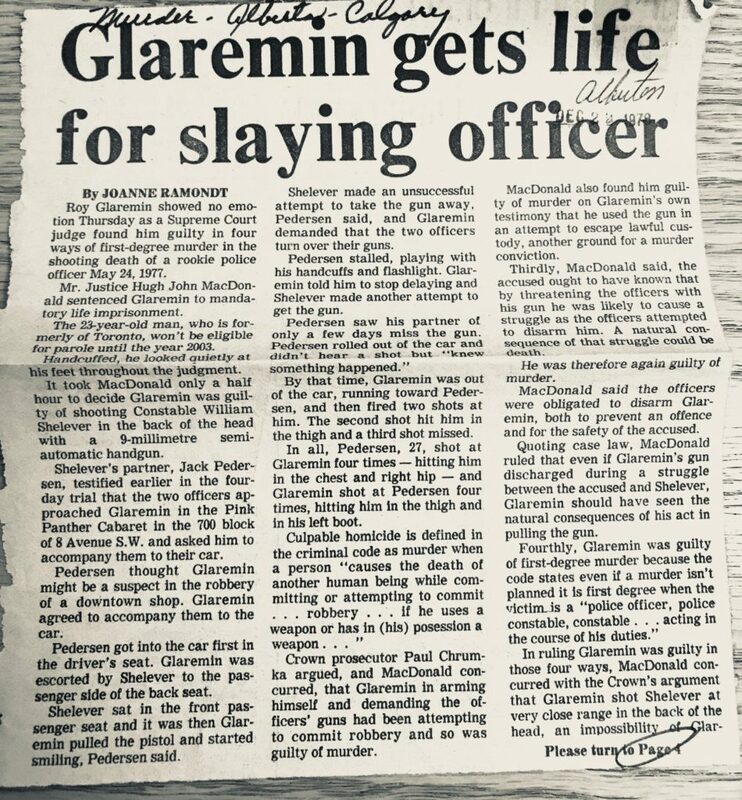 Roy Glaremin, who is this man, at 22 years old, where did he come from, what was his life like, how did he become a killer…as he sat quietly taking notes during the court case being charged with killing Shelver, FIRST degree murder. Caught nearby the shooting, extremely pale and blood on his shirt, he looked guilty. Two men described by Calgary police as associates to Glaremin have been arrested in Edmonton (just 3 hours north of Calgary) and charged with a gun shop break-in as well as armed robberies there. He deliberately shot two officers and didn’t show any remorse. First Degree Murder – what does this mean: mostly what I could find referenced the United States of America and today’s justice details not from 1970s. from wikipedi – any intentional murder that is willful and premeditated with malice aforethought. Felony murder, a charge that may be filed against a defendant who is involved in a dangerous crime where a death results from the crime, is typically first-degree. and also: First Degree Murder Overview from Field Law. First Degree Murder: Definition. In most states, first–degree murder is defined as an unlawful killing that is both willful and premeditated, meaning that it was committed after planning or “lying in wait” for the victim. (3) Without limiting the generality of subsection (2), murder is planned and deliberate when it is committed pursuant to an arrangement under which money or anything of value passes or is intended to pass from one person to another, or is promised by one person to another, as consideration for that other’s causing or assisting in causing the death of anyone or counselling another person to do any act causing or assisting in causing that death. Marginal note: (this is interesting)Murder of peace officer, etc. Today’s laws state: First degree was committed against an identified peace officer. Roy Glaremin, has been held in different levels of Prison serving his life sentence. INSERT image and You tu be link here. Proving that there’s still laws around this and they are upheld. If both parties are inmates they cannot have conjugal visits. a visit to a prisoner, by the spouse of the prisoner, especially for sexual relations. A conjugal visit is a scheduled period in which an inmate of a prison or jail is permitted to spend several hours or days in private with a visitor, usually their legal spouse. The parties may engage in sexual activity. The generally recognized basis for permitting such visits in modern times is to preserve family bonds and increase the chances of success for a prisoner’s eventual return to life after release from prison. They also provide an incentive to inmates to comply with the various day-to-day rules and regulations of the prison. Conjugal visits usually take place in designated rooms or a structure provided for that purpose, such as a trailer or a small cabin. Supplies such as soap, condoms, lubricant, bed linens, and towels may be provided. That’s Mrs. Shelever, being asked her option to Roy Glaremin requesting conjugal visits, 23 years later in 2000. Ms, Shelever can still feel the resentment toward Roy Glaremin 23 years later. That pain of losing a loved one will get easier but will never go away completely. And when your past catches up to you like this, i’m sure the flood of emotions comes rushing back to that day and time when you received this dreadful news. he is pining for prisoners rights on conjugal visits says the Globe and Main as recently as April of this year. He served. Maximum, to Medium and Minimum. Constable Jack Petersen? How about Roy Glaremin? Thank you to London Moss for the Intro and Outtro for this podcast, Jason Schnell for Tacam 40 my theme music. 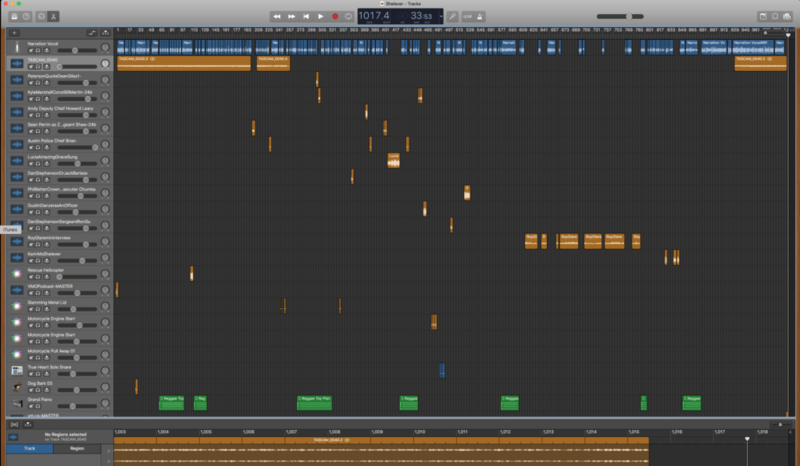 Sound effects used through Garage band: 1) Rescue Helicopter, Slamming Metal Lid in place of gun shots, Motorcycle Engine Start, True Heart Solo Snare, Dark Bark 03, Grand Piano. Research for this show has be a collaboration between newspaper articles and online research done by me Valerie Moss, produced through Garage Band and Workpress. 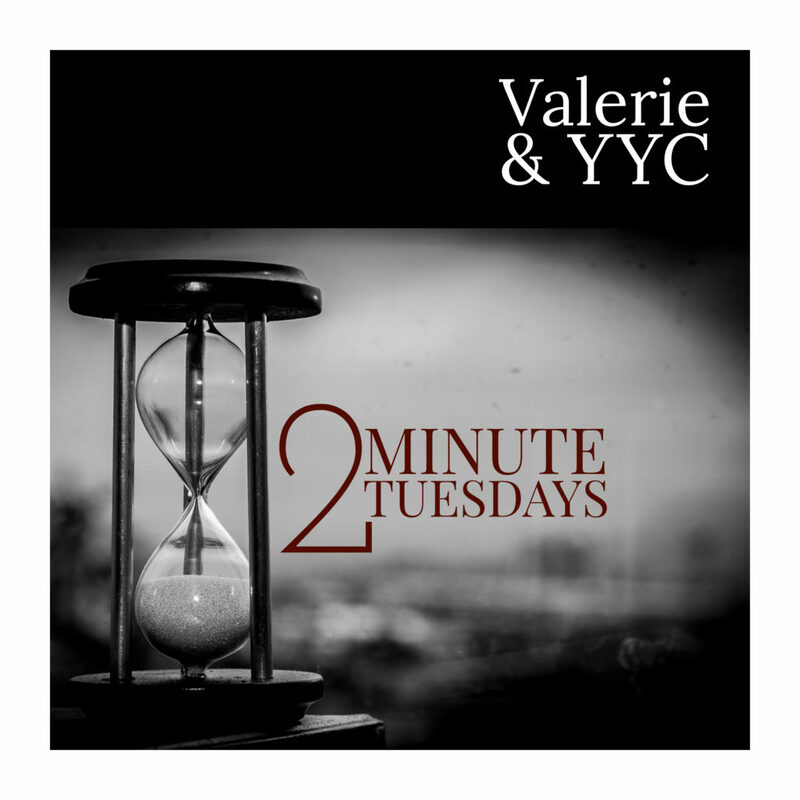 Todays Two Minute Tuesday we are looking at Calgary Languages. 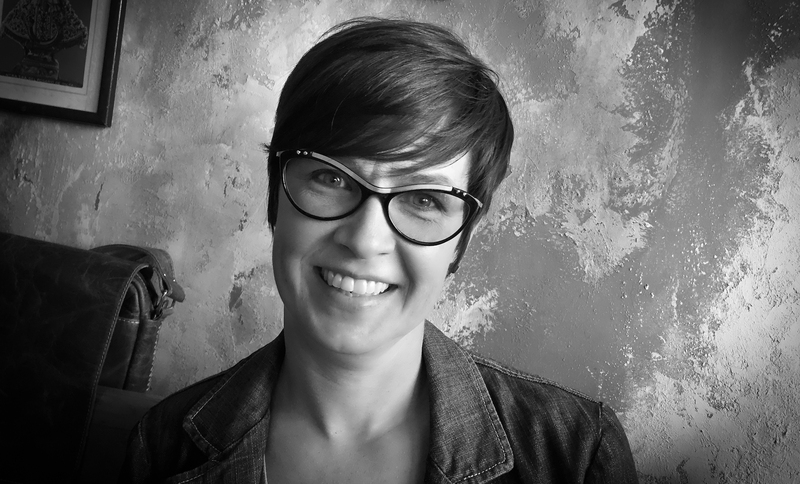 Welcome back to Valerie’s Variety Podcast, with your host me, Valerie Moss todays show is short and sweet. I’m calling these Two Minute Tuesdays or TMT’s. As I’ve been doing more and more research for my episodes and working full time, it doesn’t leave enough in the kitty to record and produced timely, so instead of releasing less often I’ve decided to do these short spurts in between the full episode segments. Let me know what you think. My focus as always will be Calgary, this great city, and all that’s captured within it. Enjoy the episode. Since we do live in a predonimantly english speaking Country, Calgary mother tongue language is English, however in the 2011 census we learned that 70% speak English, 1% speak French and 25% speak a foreign language with the top 3 being. First: Punjabi which is a Indo-Aryan language with more than 100 million native speakers worldwide, The Punjab extends from northwest India through eastern Pakistan. Second/Er: Chinese Dialects, which is separated into 5 main groups. Mandarin, Yue (which includes Cantonese), Min, Wu and Hakka make up the other four. Cantonese lay claim to approx 55 million speakers in China alone. Third/Thres: Spanish which makes up approx 2% of our Calgary population and approximately 2% of our Canadian population consists of Latin Americans. We also have many other ethnic backgrounds flourishing in our amazing city for work and to take care of their families in a safe and clean environment. I know many people who employ Philipino Nanny’s to take care of their families. These women love to nurture and support the good care of kids ultimately sending money back home to their families in the Philippines. Welcome to all our languages within Calgary and thank you for bringing your amazing Thai, Japanese, Chinese, Indian, Mexica foods into our city, what a fantastic exposure we have and our children get to explore your culture through food. Minute Tuesdays or TMT’s. As I’ve been doing more and more research for my episodes and working full time, it doesn’t leave enough in the kitty to record and produced timely, so instead of releasing less often I’ve decided to do these short spurts in between the full episode segments. Let me know what you think. My focus as always will be Calgary, this great city, and all that’s captured within it. Enjoy the episode. 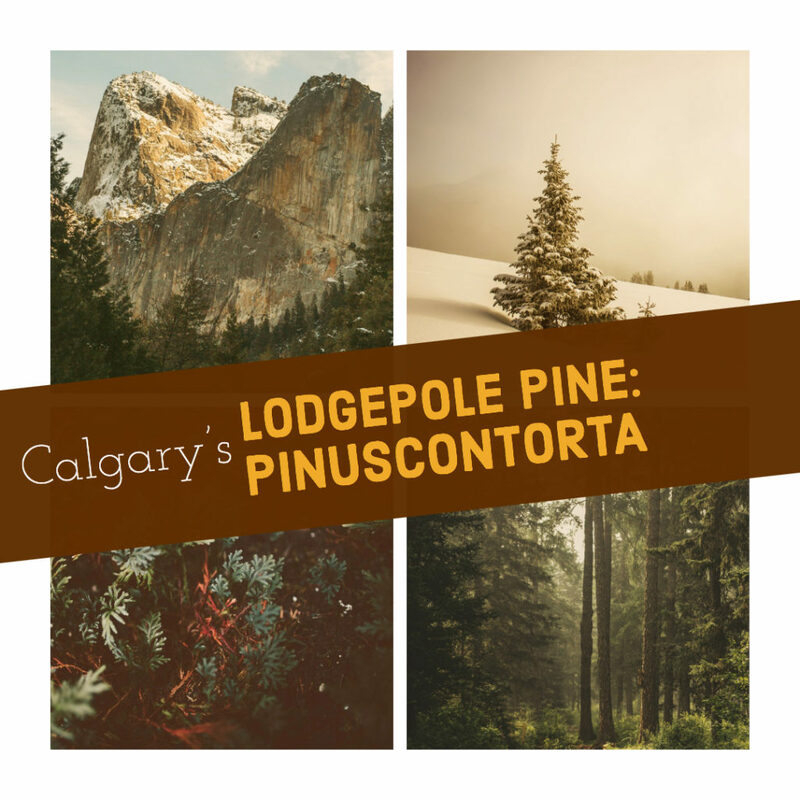 Calgary is known for the Lodgepole Pine Trees. Pinus contorta, with the common names lodgepole pine and shore pine, and also known as twisted pine, and contorta pine, is a common tree in western North America. It is common near the ocean shore and in dry montane forests Like all pines (member species of the genus Pinus), it is an evergreen conifer. Pinus contorta is a fire-dependent species, requiring wildfires to maintain healthy populations of diverse ages. They have serotinous cones. This means that the cones are closed and must be exposed to high temperatures, such as from forest fires, in order to open and release their seeds. There is also a species of bark beetle known likely to local Albertans as the Mountain Pine Beetle native to the forests of western North America from Mexico to central British Columbia. It has a hard black exoskeleton, and measures approximately 5 mm, about the size of a grain of rice. In western North America, the current outbreak of the mountain pine beetle and its microbial associates has destroyed wide areas of lodgepole pine forest, including more than 16 million of the 55 million hectares of forest in British Columbia. Please visit Valerie Moss.ca for all show notes and research details. Welcome to a fun podcast about Calgary Summer Camps for a 6 year old kid. 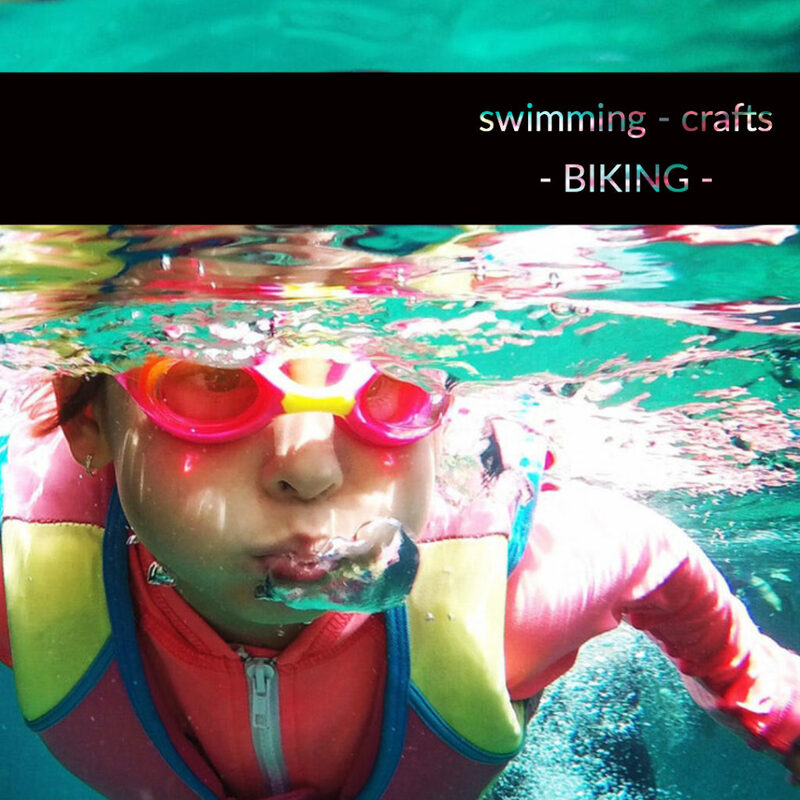 Being a mom of a 7 year old, and a working professional it’s hard to juggle camps, interests and driving around the city figuring out the best spots to put your kids, convenience, safety and costs are all a factors I look at. For this episode I’m going to review all of the camps we signed up for this year and my daughters perspective and of course mine on these gems. Facility review: this place is what you’d picture at a ski resort. It’s industrial, lites of windows, tables benches. The coaches that volunteer and work are shredded out with long hair and talk like surfing guys lol. It’s god a great vibe and everyone is pumped. Day one: she was in a group with all boys…so they tried to find another group for her which ended up being all boys also. There maybe have been a ratio issue also but I’m not exactly sure. So she stood her ground and said she would have preferred to stay in this first group as she’s already getting to know the boys names then move to a new all boys group. Good point kid! nestled in at our Canada Olympic park site where we held the 1988 Olympic Games here in Calgary Alberta. I wasn’t living here at the time of this global stamp on our amazing city but my husband was and he has very fond memories of City Pride and sense of community and euphoria rooting for our Canadian olympians. Signed her up for this thinking this would be good experience for her to learn control of her bike, hills, more aggressive biking and of course make friends and have a good time. She had a good time very challenged and satisfying. We ended up upgrading her bike to the next level. They biked 10 plus Kim’s each day. Facility review. This place is so busy located off 52 street NE it’s always a buzz being a full service leisure centre with swimming-gym parenting rooms all kinds of fitness classes and more. Great camp they use a combination of public speaking memorizing lines and acting. This is a fun camp for her she likes it and has taken away a few lines and scripts that have impacted her like Shakespear and Sally field to name a few. Fun group of staff and organized. This was such a great camp, the kids learned hand signals for turning and learned proper road riding. They do a parade at the end showing off what they learnt. They know and announce all the kids by name. These bike camps when you are car people can be a challenge. Hauling the bike to and from the locations. But it proves fruitful on what the kids learn. Obviously this setting is amazing outdoors and surrounded by animals. Nature wakes. Red hats are given to each kid lol London was not a fan of these hats. She came home good and tired. Boxing undercard Ring black room with kicking and punching bags you have to be 8 and over to go into the boxing ring. this camp was full of making potions, slime, dragon eggs, wands, and craft. There is also swimming as part of the daily activities. located at 19street and 6 avenue NW I need the Westhillhurst community centre. The community centre is a bit older you need to walk through the whole to get Tom the summit kids room there’s lots of parking tho and the take the kids as early as 8 am with before care costs and pickup by 5 without added costs so this is a bonus London says this camp this camp is babyish. They played at a fun park they was a couple minutes walk. There was an outdoor heated pool but it was too cold to go into. Plus you had to be 8 and older to go into. The camp volunteers were okay boys and girl were just boring according to my daughter. This camp isn’t structured mostly just arts and crafts. Well that sums up our camp listings for this year, thank goodness for this summer full of camps and for school starting up again finally…sheesh, 9 weeks of camp and I need a summer vacation. 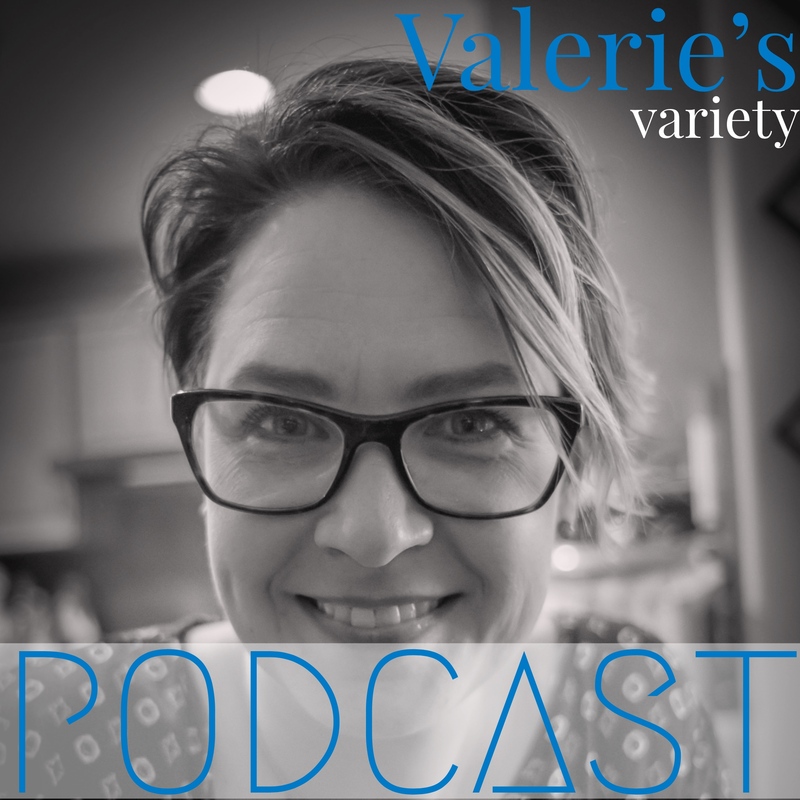 Welcome back to Valerie’s Variety Podcast, with your host me, Valerie Moss todays show is short and sweet. I’m calling these Two Minute Tuesdays or TMT’s thanks to Jeff for this suggestion. As I’ve been doing more and more research for my episodes and working full time, it doesn’t leave enough in the kitty to record and produced timely, so instead of releasing less often I’ve decided to do these short spurts in between the full episode segments. Let me know what you think. My focus will be Calgary, this great city, and all that’s captured within it. Let me know what you think! Did you know the average or median age in Calgary is 36.4 and average or median age in Alberta is 36.5 with a total population of 1.37million, 3rd largest municipality and the 5th largest city in Canada. The total population in Alberta is 4.146 million. I’ve lived in Alberta for most of my life minus a few years I spent in Saskatchewan going to College. It’s a stunning wealthy province with mountains, rivers and lakes. 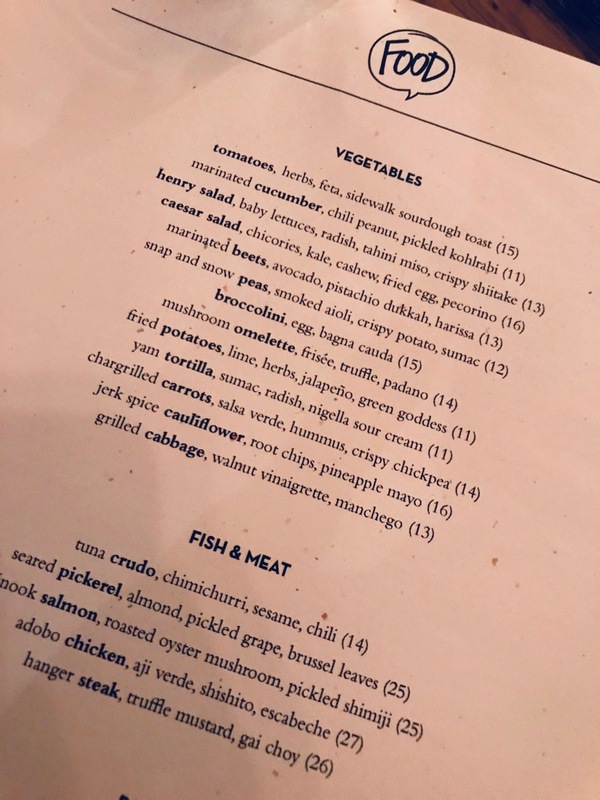 a wedding anniversary; broadly : a date that follows such an event by a specified period of time measured in units other than years, 6-month anniversary of the accident – and of course to celebrate and anniversary. In Canada, one can also receive a message from the Governor-General for the 50th anniversary, and every fifth anniversary after that. Let’s do the math on this, if I’m 41 years old, and I’ve been married for 17 years, to be married for 50 years I’d need to be…okay let’s not complete this equation. The names of some anniversaries provide guidance for appropriate or traditional gifts for the spouses to give each other; if there is a party these can be brought by the guests or influence the theme or decoration. These gifts vary in different countries, but some years have well-established connections now common to most nations: 5th Wood, 10th Tin, 15th Crystal, 20th China, 25th Silver, 30th Pearl, 35th Jade, 40th Ruby, 45th Sapphire, 50th Gold, 60th Diamond, and 70th Platinum. 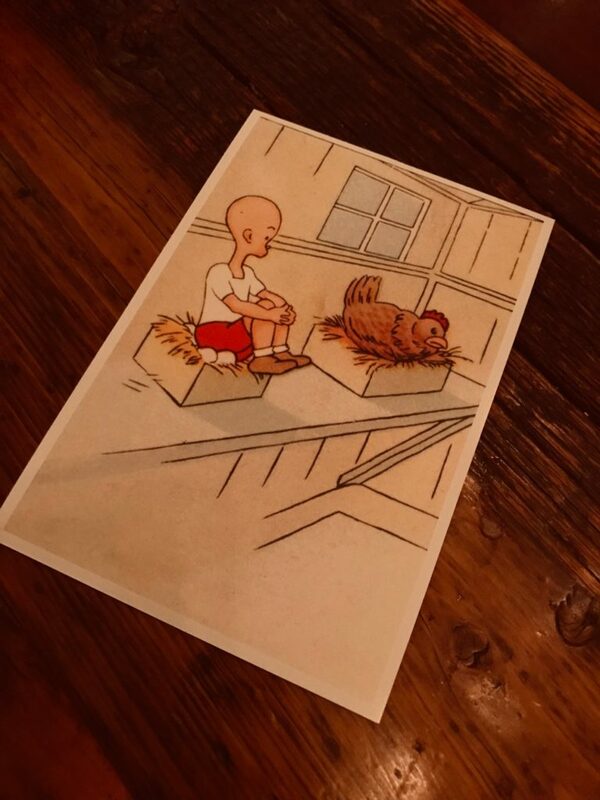 In English speaking countries the first, wooden, gift was cut on the day of celebration and then presented to the wife as a finished article before the next two quarter days had passed. This means the 4 significant dates throughout the year things like school starting, rent being due etc. The modern tradition may have originated in medieval Germany where, if a married couple lived to celebrate the 25th anniversary of their wedding, the wife was presented by her friends and neighbours with a silver wreath to congratulate them for the good fortune that had prolonged the lives of the couple for so many years. Carnelian – Carnelian (also spelled and referred to as cornelian) is a brownish-red mineral which is commonly used as a semi-precious gemstone. It is said that this stone is an energy booster, can protect one from bad vibrations, helps a person that’s insecure to find strength within them, can guard against poverty, also help give a sense of humor, increase ones appetite and calms temper.This gemstone was widely used during Roman times to make engraved gems for signet or seal rings. since we are focussing on my favourite number 17 and my 17th anniversary the colour that best represents this special year is yellow..Yellow identifies with acquired learning. It is the colour which reverberates with the left or rational side of the brain. This colour animates our intellectual capacities and making mental deftness and recognition. It is the the lightest shade in the spectrum. From a physiological standpoint yellow is elevating and enlightening. This colour also offers trust, joy, happiness and fun. In the significance of colours, yellow motivates unique thought and curiosity. Yellow is innovative from a mental perspective. The colour of new thoughts which helps us to discover better approaches for getting things done. It is the useful mastermind, not the visionary. Some other years that caught my eye based on colour alone are 4th year is lime green, 14th year is opal (who uses this word anymore), 20th is emerald green and white (why not peach), 24 is lavender (can’t you just smell this when the word is mentioned) and 35 is coral…that pinkish – salmon shade. Insight, responsibility, self-discipline, strength, compassion, spiritual consciousness, wisdom, a desire for peace and love for all of humanity. The number 17 is a highly spiritual number and has been expressed by the Ancient Chaldeans as the 8 Pointed Star of Venus. Have you ever wondered what connection you might have with a number? Can numbers really have a mystical and spiritual meaning? I believe so, there are many numbers that govern our life for example the number 17 has meanings that may have certain connection and characteristics with our life path. Sometimes numbers like number 17 show up in our life and we may not know the meaning of it. The number 17 is responsible for, Insight, responsibility, self-discipline, strength, compassion, spiritual consciousness, and wisdom, a desire for peace and love for all of humanity. the 17 person is very capable and hardworking and efficient. They have great leadership qualities and very much compassionate. They treat everyone equally whether they are rich or poor. one of my family members is celebrating her 17th year…she’s a feline, tabby with the name…evolved overtime, from Lil Tig, to Tiggy to just plain Tig, it’s my furry household friend. She has to be heard and not seen, leaves tuffs of fur in little gift piles along the house, greets me when i come home at the end of the day and sleeps with me each night…yes Tig you too are 17 this year. the age of my domestic house cat…we’ve had her this entire time also, we consider her our first family member did you know this equates to 84 human years. The teenage Gauss proved that the regular 17-gon is constructible by compass and straightedge (which is related to the previous bullet). There are 17 wallpaper groups. A haiku has 17 syllabes. A Sudoku needs at least 17 clues to have a unique solution. To the nearest order of magnitude, the universe is seconds old (approximately seconds). There are 17 ways to write 17 as the sum of primes. The Italians think 17 is unlucky (apparently because XVII can be rearranged to be VIXI, which means “my life is over”). 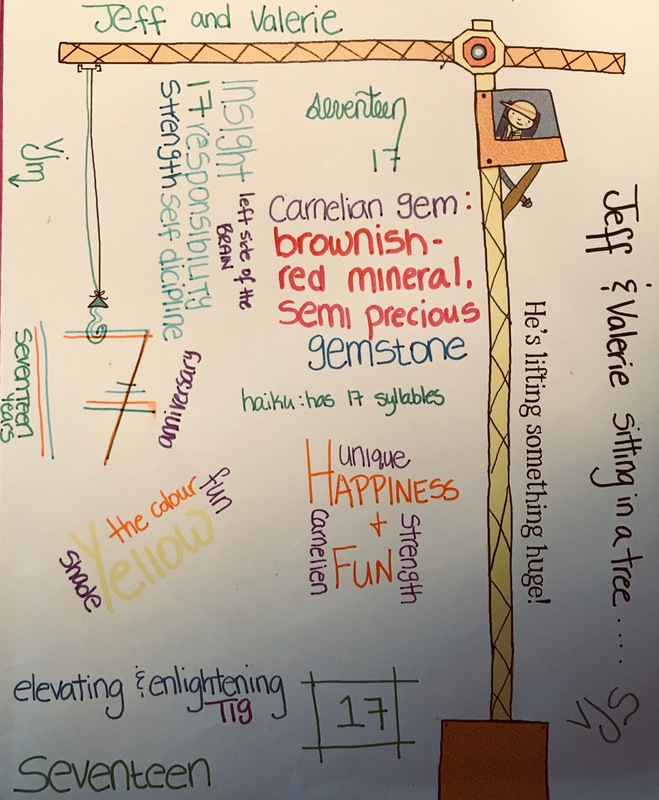 Thanks for listening to the podcast and todays reflection of my 17th wedding anniversary, the history behind the number 17 my personal favourite number and the meaning and gem that goes with this and a glimpse into my story. Also there’s only 17 weeks until Christmas. Let me know what you think by leaving me a comment/rating on iTunes, stitcher, google play, blubrry and tuneIn radio or wherever you get your podcasts. The intro and outro for this podcast is recorded by London Moss. The music for this show is written and produced by Jason Schnell, title Tascam 40. Thanks to Jeff Moss for being the voice of the Judge. The podcast is written and produced by me Valerie Moss, through Garage Band and WordPress. Two 14 year old girls have been found dead West of the city under the happy valley overpass. 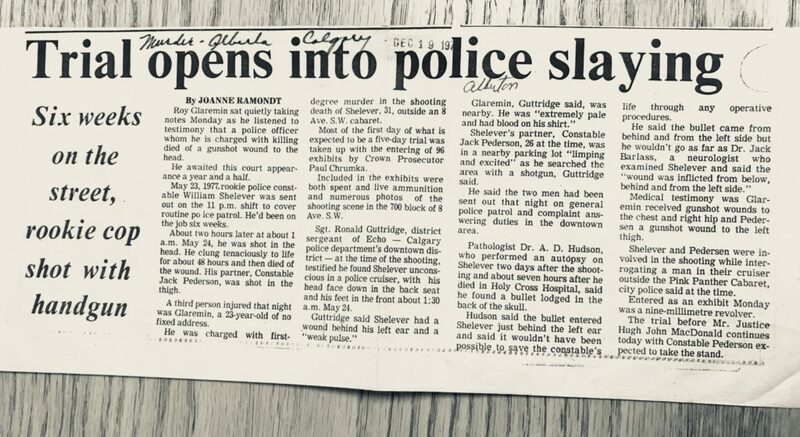 Fully clothed, no visible gun shot wounds, no visible evidence of stabbing, they would not have died due to exposure.So What happened?Someone is hiding something, this case is still COLD 42 years later. 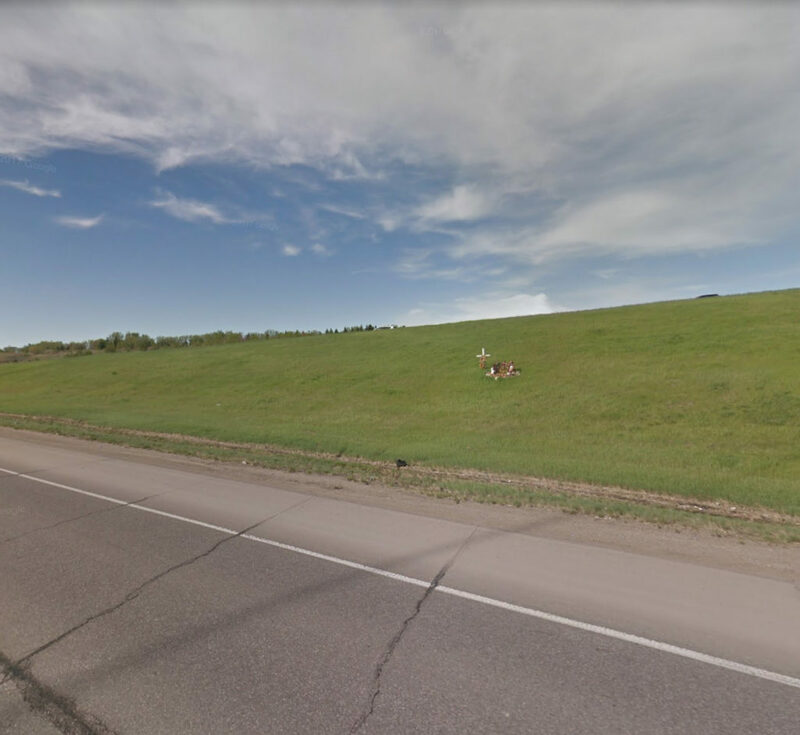 This overpass will eventually mark the area that is now referred to as Valley Ridge but at this time in 1976 this area was still a few miles out of the city of Calgary, city limits heading WEST. The Happy Valley area was a campground and amusement park from 1961 to the late 1970’s. Full of merry-go-rounds, carousel rides and a wading pool and the laughter of children, smell of hotdogs and the cracking of chips. This is a 28min drive by car direct from Ian Bazalgette junior high school to the place the girls bodies were found. If you look at a topical map of the city of Calgary from the SOUTH EAST area of the city to the far WEST end of the city heading out of town toward the rocky mountains a truly opposite direction from the girls end of town. Why here? 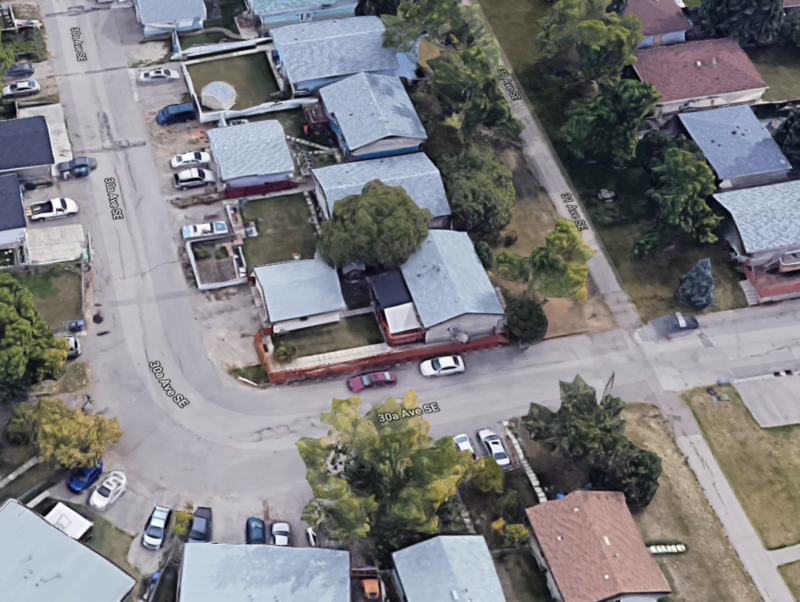 Patricia or Patsy as she was referred to resided at 2220 – 37 Street SE just SOUTH of highway 1a and EAST of 36 street in the Forest Lawn, Forest Heights area of Calgary. in 2012, 36 years later, the demographics in this forest lawn area had a population of almost 7500 people living in 3300 dwellings. Average household incomes in the year 2000 were almost 30% low income residents, approx 18 percent were immigrants, the main buildings and residents were condos and apartments styles and almost 60% were rental units – high density housing. From the web archive crime database as far back as I can go to 2002, still 35 years later Person crimes like asault, battery, robbery was 16/1000 and property crimes were things like break and entry, theft from vehicles etc was 57/1000. 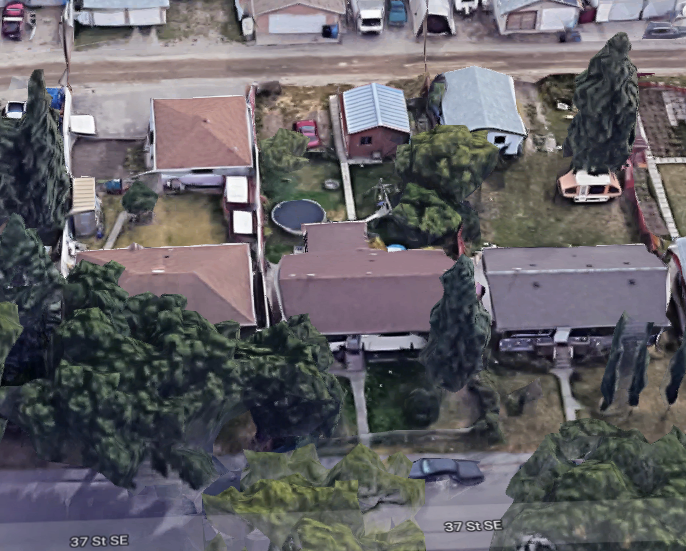 When I look at the house Patsy lived in according to google images today this appears to be a 1950’s home Typical bungalow style with a 3 step porch up to the door, it has a short metal fenced front yard with a gates up the side walk, the house is an off white colour today with brown window trim. You can assume the two windows on the right are bedrooms and the large window on the left is the living room. Of 3131 – 30 A avenue SE. – in the community of Dover, EAST of Highway 2 and south of Highway 1A. In 2012, 36 years later the demographics of the community of Dover had a population of 10,302 living in 4,722 dwellings and average household income in the year 2000 was $43,875 and approx 24% were low income residents. 15% of the residents were immigrants and almost 30% of the buildings were condo units, apartments and rental properties – high density housing. From the web archive crime database as far back as I can 2002, 35 years later; Person crimes like asault, battery, robbery was 16/1000 and property crimes were things like break and entry, theft from vehicles etc was 44/1000. Lower than in Forest Lawn but still significant. According to google images today, Eva’s home was on the inside of a small cal-de-sac, again it was also a bungalow style duplex, her home as on the outside of the cal-de-sa with the front view facing a walking path. Obviously these crime rates from 2002 would likely be higher then in 1976 however in 1976 people didn’t report crime like they did in 2002 and of course today. However these crime rates are significant. Higher in the area where Patsy lived then where Ava lived but we can surmise the girls lived in a rougher part of the city. Both girls lived close to and addended Ian Bazalgette Junior High School to the north Patsy and the south Eva almost the same distance from the school. Patsy in grade 9 and Eva in grade 8. Patsy being at the top of the school and the final grade in this school, and Eva likely looking up to Patsy as she was the older one. Both of these girls were average in their academics and popular. 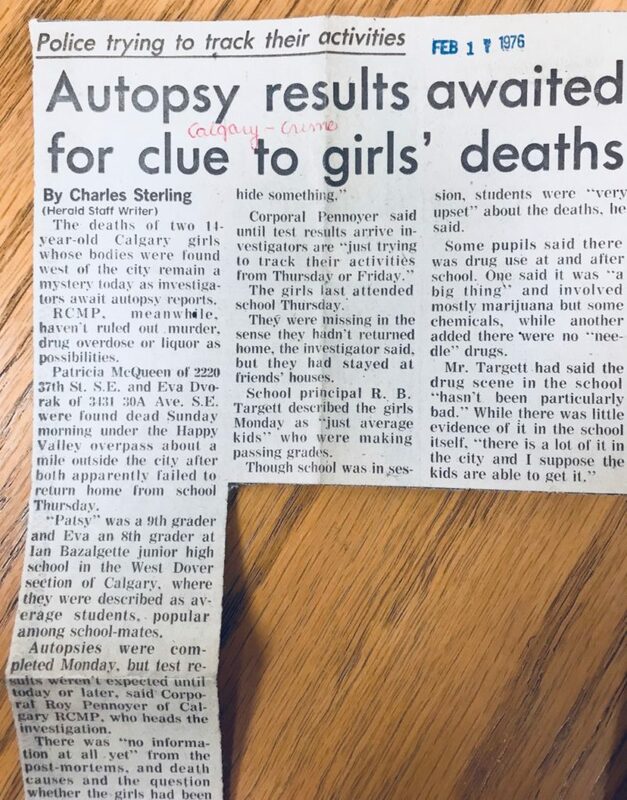 In the following days after the girls were found laid against an embankment in the late hours of the morning the previous Sunday an autopsy was performed on both of them. With the possibility of murder, drug overdose or liquor being involved there was still so many questions unanswered. The girls had been missing since the previous Thursday but were staying with friends and not touching base with their families. Some of the pupils at the school were interviewed and commented about the use of drugs at school and after school – things like marijuana and some chemicals but no hard needle style of drugs. They concurred both of these girls engaged in these sort of activities. However in the end the autopsy found nothing significant to realize their deaths. 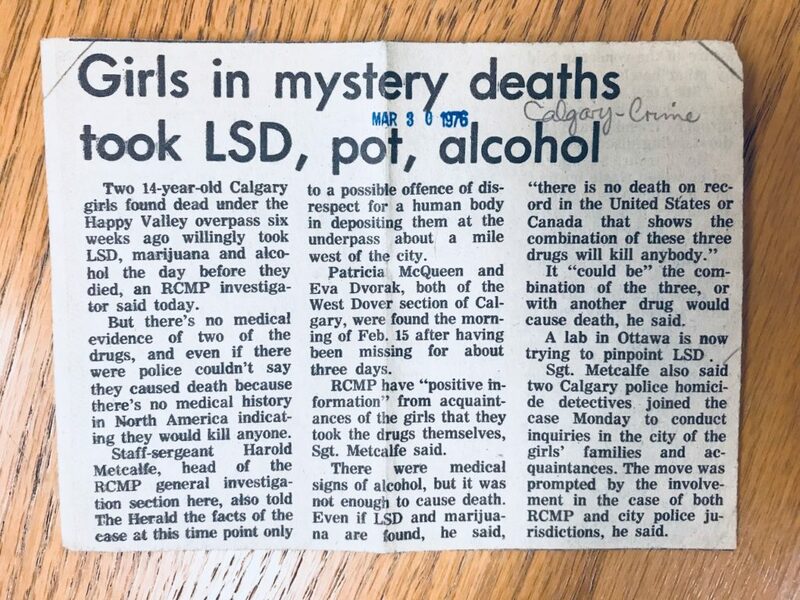 A news article almost 6 weeks later mentioned that both girls willingly took drugs, LSD, marijuana and drank alcohol but non of this would have caused their death. Being asked to leave school on the Friday before their death due to having alcohol on their breath, then proceeded going from party to party all weekend long, taking drugs, drinking and visiting with friends. They were hitch-hiking on 9ave SE when a neighbour stopped to offer them a ride – which they declined, this was the last time they were spotted alive. Then they were discovered under ironically called “Happy Valley” overpass which in itself should be a delightful place to visit and make memories not be found under it stopping any future memories of existing. The autopsy nor the crime lab tests showed any proof as to how they died. No signs on their bodies to indicate foul play against them and nothing in their systems revealed any drug or alcohol reference that would have proved their fate. Their bodies based on the position of them and how their clothes were – showed they were dumped. Strangulation is most likely the cause but there we no marks on their necks to indicate this, possibility of smothering by drug related accident like passing out with face in pillow was also speculated as a cause. The weather was not a factor altho it was Feb in Calgary which can be typically the coldest winter months but since the girls were moved to this location – weather was determined not a factor. The Judge KJ Plomp called the deaths a sad and tragic situation which leaves many questions unanswered. The thing that concerns me is that conditions and situations such as we’ve encountered do exist, and 14 and 15 year old girls are running free like this, they are just children. 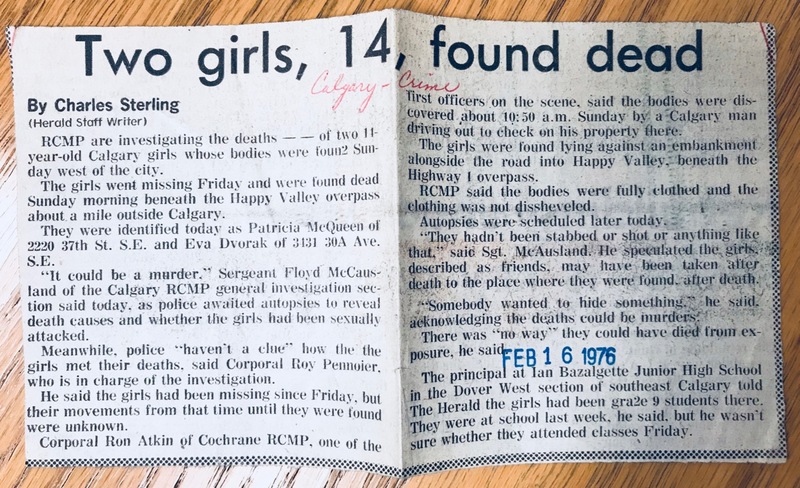 In closing, Calgary Cold Case: 1976 Mystery Deaths of Patricia (Patsy) McQueen and Ava Dvorak marking the 42nd year of their COLD case. In reflecting back to my 8th and 9th grades in school, by all accounts could be classed as one of the hardest times in one life especially for a girl, going through puberty, finding friends you can trust and trying to be independent of your parents. Who doesn’t want the attention of older kids and someone to lookup to. At this time in ones life you just hope these ‘older’ kids influence you for the positive. Who gave the girls these drugs and how much they took and what they decided to do before during and after is on them, they made this decision alone, together. They were influenced and pressured and didn’t have their thoughts inline because they were only 14 years old. They were Children as the judge said. Coming from an area in the city that proved to be low poverty and crime heavy also gave them a more difficult start and possibly not the best environment to grow up in and be influence by. According to Eva’s sister, Martha and Brother Gord in this CBC article they touted Eva as a normal girl, who was fun to be around. They also commented that these two girls were just 14 years old. They are missed by their families, siblings and friends – they all want closure – what happened to these girls? You can’t help but wonder and want to know. Were you around in Calgary at this time? Did you know the girls? Were you one of their friends? Did you attend the school in 1976 Ian Bazalgette, what was it like? If you have any information about this case or a story about the girls that you want to share, let me know. Thanks for listening to the podcast and this new series, Calgary history and let me know what you think by leaving me a comment/rating on iTunes, stitcher, google play, blubrry and tuneIn radio or wherever you get your podcasts.